On Friday, 24 August 2018, using excessive lethal force against the peaceful protesters in eastern Gaza Strip for the 22nd Friday in a row, Israeli forces wounded 89 civilians, including 17 children, 2 women and 3 paramedics, after hitting them with live bullets and direct tear gas canisters. Five of those wounded sustained serious wounds. Moreover, dozens of civilians suffered tear gas inhalation, despite the decrease in the number of participants in the demonstrations on the fourth day of Eid al-Adha. Durng this week, the Israeli forces continued to target medical personnel working in the field, wounding 3 of them. Moreover, an ambulance sustained damage in eastern Jabalia, indicating that there is a systematic Israeli policy to target medical personnel and obstruct their humanitarian work, which is protected under the rules of international humanitarian law. The Israeli forces used upon highest military and political echelons excessive force against the peaceful demonstrators who posed no threat to the life of Israeli soldiers. Injuries 6729 1140 203 78 103 Among those wounded, 422 are in serious condition and 69 persons’ lower or upper limbs were amputated. Statistics of the injured only include those directly hit with bullets and tear gas canisters as there are thousands others suffered tear gas inhalation and sustained bruises. Investigations and observations by PCHR’s fieldworkers emphasize that the demonstrations were as always fully peaceful and PCHR’s fieldworkers did not witness weapons or armed persons whereas Israeli forces’ snipers continued to position on the hills, behind the sand barriers and in military jeeps along the border fence. 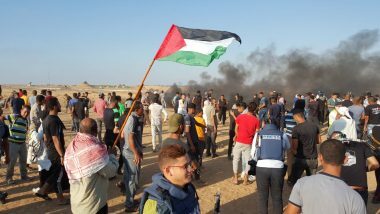 At approximately 16:30, thousands of civilians, including women, children and entire families, started swarming to 5 encampments established by the Supreme National Authority for the Great March of Return and Breaking Siege along the border fence, east of the Gaza Strip’s governorates. They raised flags, and chanted slogans and national songs in addition to flying kites and firing balloons, while hundreds of them, including children and women, approached the border fence, set fire to tires and attempted to throw stones at the Israeli forces. The participants were present around 300 meters away from the main border fence. The Israeli shooting, which continued until 19:30, resulted in the injury of 89 civilians, including 17 children, 2 women and 3 paramedics. Five of those wounded sustained serious wounds. In addition, dozens of civilians suffered tear gas inhalation and seizures after tear gas canisters were heavily fired by the Israeli soldiers stationed in military vehicles and by drones hovering over the protesters in the eastern Gaza Strip. PCHR hereby condemns these crimes committed by the Israeli forces, believing it is as a result of Israel’s enjoying impunity thanks to the U.S. and so encouraging the Israeli forces to commit further crimes upon an official decision by the highest military and political echelons.